It’s hard to believe that right before this picture was taken, these two little angelic girls were sticking out their tongues! It’s hard to believe that Emmy entered the “terrible two’s” in July! Emmy loves taking on her big sister, and insists that she is big, too. She rivals Lily in talking up a storm. She loves playing with her “babies,” and also loves dogs…from a distance. 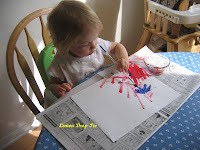 She finally realizes that watercolors are used to paint pictures…not for a snack! It’s hard to believe that Lily is now five years old! She attends Grace Preschool five mornings a week. 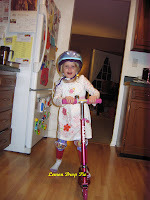 On nice days she can be seen on her hot pink scooter, helmet and kneepads in place, zooming down the sidewalk! During these colder days, she is often found in the dining room, drawing pictures and using all the scotch tape she can get her hands on. It’s hard to believe that we will not again hear Grandma Virginia’s dry wit. Yet I see the dimple from her smile on the faces of my husband and little girls. 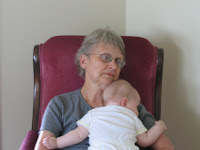 It’s hard to believe that we will not again see Grandma Loreeta rock and sing another baby to sleep. Yet I sing the same lullabies to my two babies. It’s hard to believe that God would send His Son to die for us, so that we will see Virginia and Loreeta in heaven again! It's so hard having both grandmas gone for the girls, I'm sure. Jonathan has both his grandmothers and one grandpa around. I'm sure this Christmas was a tough one for all of you, but you are right…you will see them again one day. Happy belated. I'm so sorry you guys have seen so much loss this year…I love the pictures of the grandmas with their little babies snuggled so close. So sweet. That's a wonderful way to see it. I am so thankful for that gift from God that one day I will see so many precious people again. I don't have to be sad that I didn't get to say goodbye one last time because I can look forward to never having to say goodbye again… PRAISE GOD!Thank you for visiting our little blog! This post is beautifully written! It sounds like you have many fond and happy memories the girls' grandmothers. It's not always easy, this post is beautiful. Blessing come and blessing go but God will always be there for us.